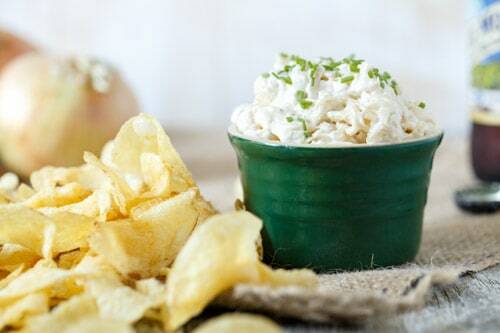 What is it about onion dip that makes it so unbelievably addictive? Growing up (and honestly, even now), I always would make a bee-line directly for the onion dip at backyard bbqs. And yes, almost always it was that powdered mix variety that was combined with a container of sour cream. And sometimes it was even served within that sour cream container. You know what I’m talking about, right? Just something about that cool and creamy concoction made it impossible to resist. The bowl of potato chips didn’t hurt either. Caramelizing the onions help to develop an intensely rich, deep, and sweet flavor. 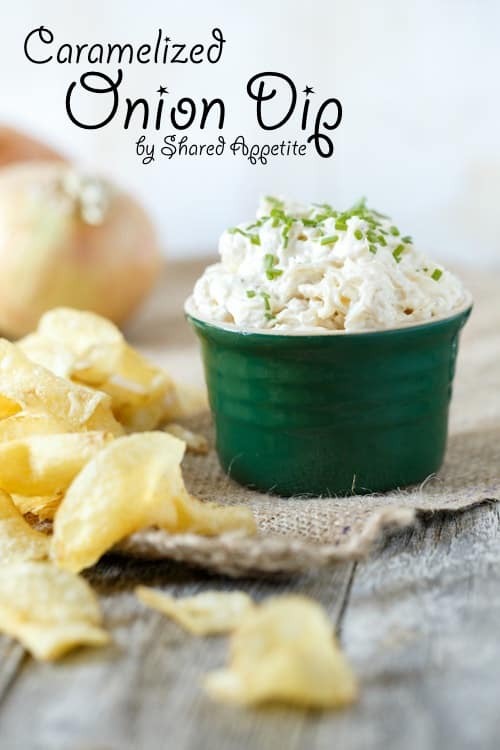 Mixing them up with some thick creamy goodness, and well, that makes for one crazy good party dip. And when picking a potato chip, I prefer a strong, sturdy one. There is nothing worse than a weak potato chip that crumbles as it tries to pick up a bit of dip. Then you’re trying to pick the pieces out and ugh, it’s not pleasant. Go for the good stuff. Heat butter and olive oil in saute pan over medium/medium-low heat. Add onions and season very generously with Kosher salt. Sprinkle with freshly ground pepper and a little bit of cayenne pepper (if using). Cook onions slowly, stirring occasionally, until onions have wilted greatly and have turned a caramelized golden brown, about 35-45 minutes. Depending upon how hot your stovetop is, this time could vary. Allow onions to cool. Mix cream cheese, sour cream, mayo, and caramelized onions in a bowl with an electric mixer fitted with the paddle attachment (I use my Kitchen-Aid stand mixer) until fully combined. You could probably mix by hand if needed. Taste and adjust seasonings as needed. Serve immediately at room temperature. If making ahead, refrigerate until about 20 minutes before ready to serve (to allow for mixture to soften and come to room temperature). Serve with potato chips or vegetable crudites…. but really potato chips. 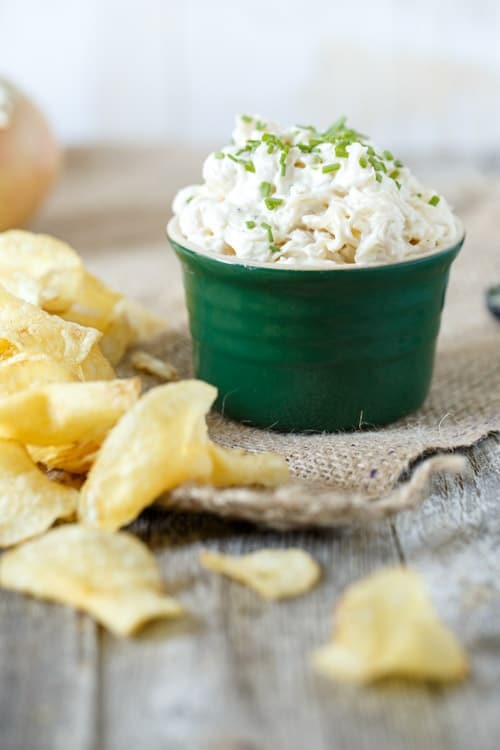 oh my word…I love homemade onion dip. I make it all the time for parties because it is just so much better. I like to put some fresh sage in my dip…it really gives it a nice flavor! And sometimes I’ll even use red onion. Next time I am going to try adding some cayenne and chives…that sounds great!!! I can’t wait to try it! We love onions, esp. the caramelized onions…the dip looks heavenly! Thanks for stopping by Angie! Yes, caramelized onions sure are amazing!